Suggested Use: Take 2 capsules with a meal twice daily. Other Ingredients: gelatin, cellulose, silica & magnesium stearate (vegetable source. Lecithin derived from soybeans. Kyolic Aged Garlic Extract begins with 100% organically grown garlic bulbs. They are then aged to perfection in a uique extraction process to eliminate odor and create beneficial compounds found only in Kyokic. 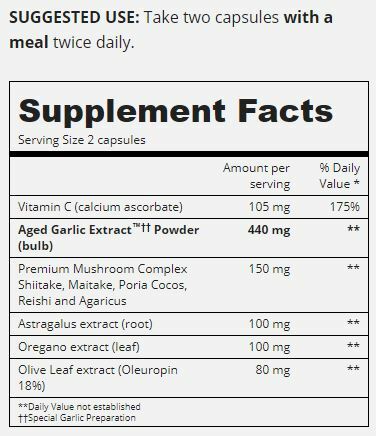 Aged Garlic Extract™ [220 mg]; Premium Mushroom Complex [75 mg]; Vitamin C [52.5 mg]; Astragalus Extract [50 mg]; Oregano Extract [50 mg]; Olive Leaf Extract [40 mg] (per capsule). Click the button below to add the Immune - Kyolic 103 to your wish list.